Who doesn’t love a good monster flick? Seriously…who? It’s always fun to watch a pulpy, rollicking yarn with some creepy creatures flickering across the silver screen. I binge watch the Corman Poe movies every Hallowe’en (The Pit and the Pendulum is my favorite, though “The Masque of the Red Death” is my favorite Poe story), and to hear the velvety Vincent Price intone his (slightly melodramatic) lines, alongside the cheesiest effects ever, always fufills something within me. 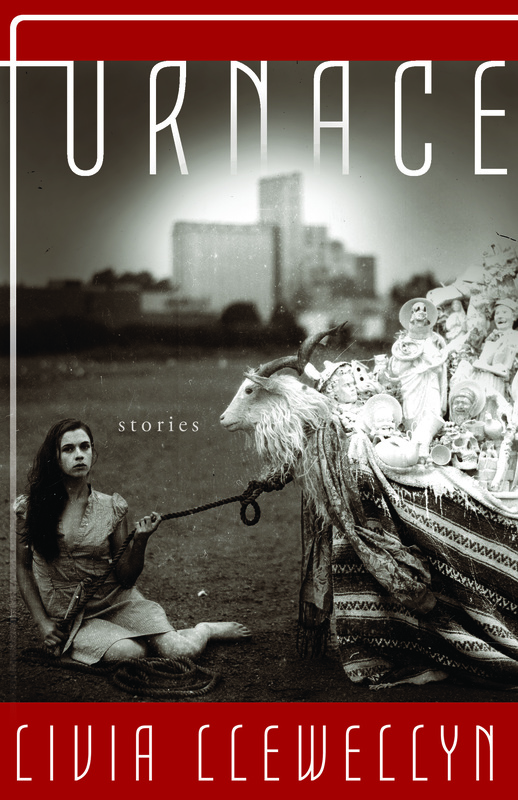 I got that same sense with Painted Monsters & Other Strange Beasts, a 2015 collection by writer Orrin Grey, published by the justly renowned Word Horde. This is my first experience with Grey’s work (unless you count his creepy Nyarlathotep fragment for artist Michael Bukowski), but, after having read this book, I am eagerly looking forward to grabbing all of his work, including his first collection, Never Bet the Devil, and the anthology he co-edited (with the wonderful Silvia Moreno-Garcia, one of his long-time collaborators) Fungi. Obviously the first thing that strikes you is the Nick Gucker cover, which, as is typical of Gucker, is completely frickin’ awesome, and manages to capture the spirit of the entire collection. The drippy, gross, colorful style gives it a very fitting pulpy feel, rather reminiscent of Graham Ingels. A lot of the monsters in the background eventually pop up in the stories. One notable detail is the mutated Goya (later appearing in the titular novelette) in the background – Saturn Devouring His Son always had a particularly upsetting place with me. The introduction by the inimitable John Langan is also fascinating, one that perfectly sums up Grey’s craft in crystal clarity, besides being an interesting read. The stories each feature some short notes by the author at the end (which I love), further explaining the heavy influence of cinema on this book. Every tale here has some sort of film influence on it, but they aren’t pastiches, they’re tributes – though perhaps I better save that particular passage for the conclusion of my review. First, let’s examine the stories. “The Worm that Gnaws” is a classic, Cockney-accented tale in the style of the pre-Code EC Comics. I could easily see Jack Davis drawing the exploits of two Edinburgh grave-robbers who have a problem in supply…due to worms. Not ordinary worms, either…it’s a fantastically fun tale (I sense a tribute to Robert Louis Stevenson’s “The Body Snatcher”) with some really creepy moments, and just the right touches of character development and dark philosophy to give it a nice weight. The classic ending is chilling, leaving a darkly unresolved conflict and fearful decision – never gets old if it’s done right! I strongly recommend this awesome PseudoPod reading of the story. “The White Prince” is a bite-size (a little over three pages) vampire story – sort of. It explores a different type of vampire, a more monstrous and perhaps more dangerous one – sort of like Dracula (referenced in the story) mixed with Lovecraft. It has some very interesting concepts, and I can only lament that it is not longer and more fully-realized. Mr. Grey could fill a good novella developing these characters that I want to know more about, exploring the possibilities his vampire offers, and so on – though perhaps the story is modeled on Stoker’s Dracula a little too much for a longer format. Still, I do hope Mr. Grey considers exploring this tale some more! “The White Prince” is followed by another vampire story, which is surely the better-realized tale. 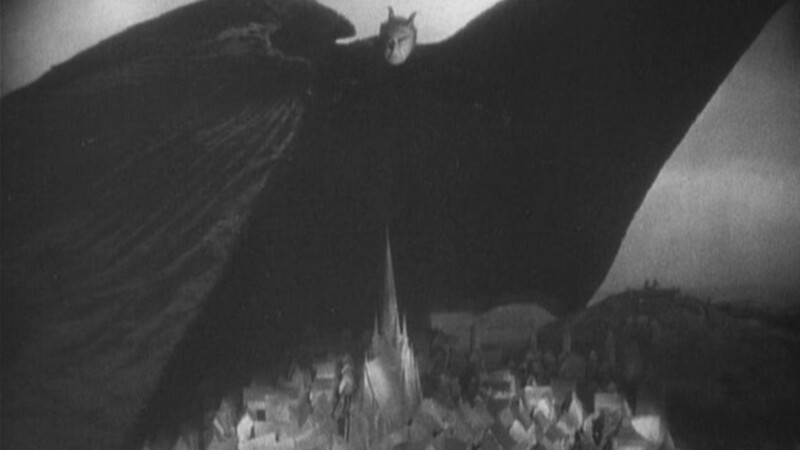 “Night’s Foul Bird” features another weird vampire, and takes heavy inspiration from silent films, in particular Murnau’s, like Nosferatu and Faust. It’s a haunting prose poem that tells of the arrival of a cadaverous man (nicknamed by the young girl who narrates the story “Mr. Chaney”, due to her love of silent films) to a dismal tenement in a lonely city. The dream-like atmosphere gently pulls you through, drifting among the snow-drowned wastes of the rotted city. It’s awe-inspiring. I literally imagined some of the sentences as shots in a silent film. One of my favorites. Emil Jannings as Mephisto from F.W. Murnau’s Faust (1926), a shot that Grey featured in the story – one that he “really wanted” in there, according to his notes. An abrupt shift in in style comes with a gory spin on the 1932 Poe adaptation Murders in the Rue Morgue (a film I have yet to see, though I do desperately wish to) – “The Murders on Morgue Street”. This one is a particular standout for its violence and weirdness, with some truly nasty imagery on the very first page and a strange, supernatural twist on Poe’s classic culprit. A series of very odd murders are occurring in town, and there’s not much of what you’d call a “body” left. This is followed by some odd incidents at the morgue, after which the story spirals into horrifying delusion, leading up to a fantastic conclusion that legitimately surprised me. It’s another piece of perfection in Grey’s oeuvre that remains one of my favorites in the book. Nick Gucker’s interpretation of one of the characters (you can see it on the cover) is my favorite part of the whole composition. Another curiosity appears in the form of the über-creepy “Ripperology” (from Word Horde’s anthology Tales of Jack the Ripper), a philosophical exploration of the infamous Whitechapel Killer. As someone who finds particular interest in classical murders, this story was thoroughly fascinating. The narrator meets a fellow writer at a convention who has a slight obsession with infamous murders, and from then on the story simply spirals into creepy territory. “Ripperology” features a healthy dose of philosophy on identity (through Jack the Ripper, of course) and a nasty little tale that ends with a perfect shudder. The next story, “Walpurgisnacht”, originally appeared in another Word Horde book, The Children of Old Leech, which paid tribute to that master of modern weird, Laird Barron. It is regarded by many (Justin Steele and Michael Wehunt included) to be the finest story in this collection. While it wasn’t necessarily my favorite of the lot, it was still a very elegant and chilling yarn. An older, decidedly decadent man decides to throw a grand goodbye party that goes horribly wrong. Grey cleverly sets the story in an actual hotel atop the actual Brocken, a German mountain that, according to folklore, is devil-haunted. A particular section about wandering amidst the empty corridors of the hotel stuck with me – as someone who has often been alone in hotel corridors, I understood the anxiety the narrator felt when navigating them. A fine story indeed, if not my favorite. 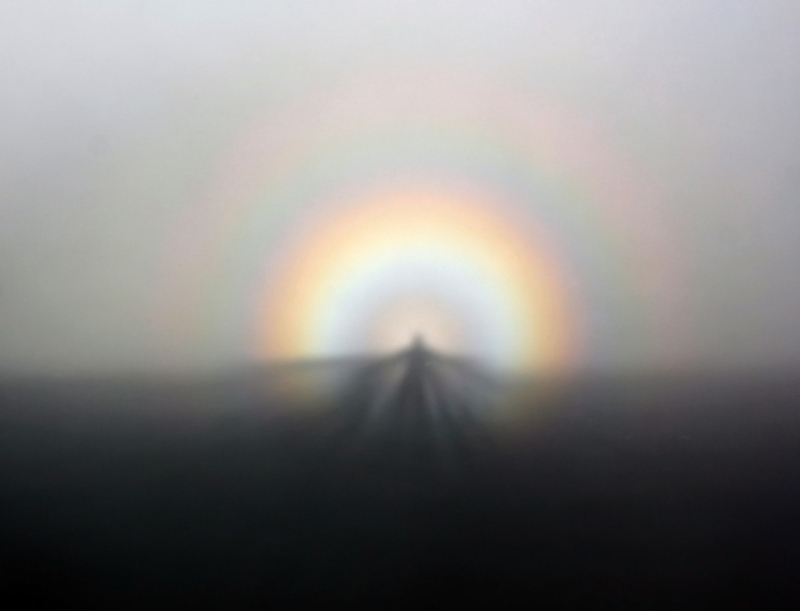 The infamous “Brocken Spectre”, referenced in the story. As one who is not a particular fan of slasher movies, I have never seen a giallo film, but if they’re anything like “The Red Church” (originally appearing in yet another Word Horde anthology, Giallo Fantastique, which I now intend to read), they’ve got to be awesome. “The Red Church” is another favorite here, combining some slightly Lovecraftian elements with some extremely nasty gore. As somebody who has been to a Gunther von Hagen exhibit (which admittedly made my stomach turn a bit), I could relate (well, not really, but a little) to our hapless protagonist’s experience at a reclusive artist’s studio. The story never stopped being creepy, with moments of genuine horror and another awesome twist ending in the style of the pre-Code horror comics. Definitely one of my favorites. “Remains” is one of the weirdest stories in the book. Like…really weird. It tells of two cops investigating the abandoned house of a child murderer to see if there’s any supernatural residue (the narrator had an exorcism in his childhood). Grey creates a great atmosphere with very subtle signs of the disturbing truth, and the conclusion unveils a peculiar meaning behind the…well, you’ll find out when you read it. It was a great story, if rather strange, and I can’t help but wonder if Mr. Grey will ever write the story of the narrator’s mysterious exorcism. Make it a John Silence/Carnacki thing, maybe. It’d be interesting. “The Labyrinth of Sleep” is what I imagine would happen if William Hope Hodgson wrote a story in Lovecraft’s style. 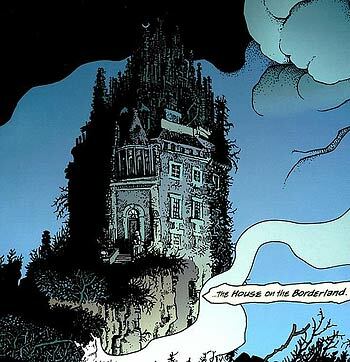 It’s no surprise, then, that the tale is inspired more by Hodgson’s House on the Borderland and the Richard Corben comic (I really loved the art, but I hated the adaptation) than the Lovecraftian Dream Cycle which it was based upon. Following a “rider” into a deep dreamworld to find his partner, it features an odd mesh of sci-fi and fantasy. While, according to the author’s notes at the end, it is a Dreamlands story, the end touches a bit more on the Cthulhu Mythos than the rest of the tale. Excellently executed. 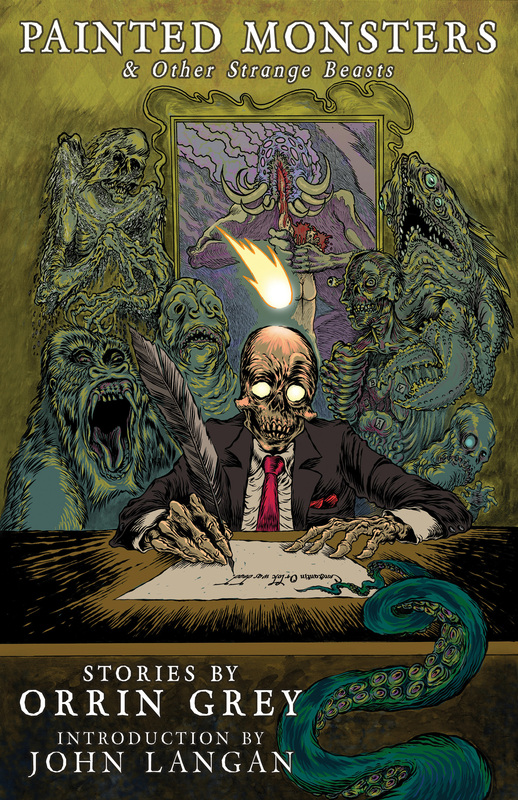 The final panel from the graphic novel adaptation of The House on the Borderland, written by Simon Revelstroke and illustrated by Richard Corben (with colors by Lee Loughridge and letters by Clem Robins). “Lovecrafting” takes the strangeness of the two that proceeded it and dilutes it a bit. It’s definitely weirder then “Remains”, but it doesn’t descend into the vivid dreamworlds of “Labyrinth”. Presenting itself as a sort of film script with excerpts from imaginary weird tales, the story follows an aspiring writer who’s particularly obsessed with the deaths of famous horror authors (i.e., Poe, Bierce, Machen, Howard, Hodgson, and of course Lovecraft). The imaginary weird tales provide insight into the true horror that surrounds the story, which Grey carefully keeps concealed. The scenic descriptions are absolutely beautiful, and those weird tales grossed me out – as they were obviously meant to. “Persistence of Vision” is stunning. It’s a horror masterwork, an exploration of classic fears mutated into something new. Ghosts are spilling through into our world, rapidly causing a gruesome and unexpected apocalypse. Grey combines elements of classic hauntings – things that can seem hackneyed or overused – and then uses them so well that they scare the sh*t out of you. Its drags you across the coals of horror and develops believable characters with struggles you’re invested in. Grey also returns to some cinematic treatments here, asking the reader from the very output to imagine the story is a movie, so it’ll be easier to deal with the horror. It quite rightfully got a spot in superpower editor Ellen Datlow’s Best Horror of the Year Volume Seven after having appeared in Silvia Moreno-Garcia’s Fractured: Tales of the Canadian Post-Apocalypse (best title ever). Grey’s talent at its finest. The Japanese monster movie Pulgasari forms the inspiration for “Strange Beast” – or, more correctly, the shocking story behind it. “Strange Beast” takes an almost epistolary form as notes for an unfinished book – a non-fiction book about the strange legacy left behind on a mysterious island. The horror takes an unexpected form in this one – Grey making use of very clever misdirection to cause a stunningly well-executed plot twist. The horror is certainly more frightening than it originally appears. Truly heart-breaking scenes, bleak ocean scenery, vivid description, epistolary format, twists and turns, monsters and movies – what more could you want from a story? This one is a real standout and has to be one of my favorites in the collection. Gucker’s cover interpretation of the titular creature is also wonderful. Finally, we conclude with the collection’s namesake: the novelette “Painted Monsters”. This was the only real way to round out the collection. Each of the stories in the book was focused on a particular film/film era: the silent films of “Night’s Foul Bird”, the ’30s flicks of “The Murders on Morgue Street”, the giallo slashers of “The Red Church”, the Japanese tokusatsu movies of “Strange Beast”, etc. How do you conclude that theme? It’s quite obvious: throw in everything. “Painted Monsters” is a tour-de-force through horror itself; dragging together influences from the dreamlike silence of Murnau; the screaming psychedelia of Argento; the story-telling aesthetic of Mignola; the otherworldly cosmic forces of Lovecraft; the fantastical whirlpools of Poe; the misanthropy of Frankenstein; the romance and Gothic shadings of Dracula; the gruesomeness of Clive Barker; the makeup monsters of Jack Pierce and Lon Chaney, Sr.; the ghastly fun of Romero’s Creepshow; the magnitude of King and Barron; the surrealism of Bartlett; the wildness and cleverness of Gaines and Feldstein; the dark masterworks of Goya and Ingels; the classic performances/monologues of Vincent Price and Boris Karloff; the weird expressionism of The Cabinet of Doctor Caligari; the power of horror as a whole – drags together influences from all those places (and more), yet manages to mold them into something completely new and original. It name-drops more things than you can count, yet it never feels contrived or out-of-place. It has long, over-the-top monologues by corny villains, yet it still retains an aura of menace and fear (especially on the last few pages). It has a classic, secluded setting, but it doesn’t feel hackneyed or over-done. The story is a mish-mash of classic twists and turns that you still don’t see coming because it doesn’t feel like a rehash. It isn’t a rehash, or a pastiche, or a rip-off, or anything of the sort. It’s a tribute, and that’s what makes Grey’s writing so very special, so very important. An astounding amount of passion for these classic masterpieces is obvious from the very moment you see that (oh-so-beautiful) Nick Gucker cover, from the moment you read Langan’s introduction, from the moment you read the dedication and epigraph, from the moment you read the stories and the author’s notes and the afterword and the acknowledgements and even the bio, but it never feels old or done-before. It feels new, simultaneously original and familiar at the same time, because Grey is avoiding pastiche while acknowledging influence. So many authors today fall into that trap and end up writing copies of Lovecraft and Poe and Machen, but Grey takes old themes and runs with them in his own direction, refurbishes them, develops them, even improving them. The titular novelette sums all of this up in perfect clarity, the cherry on top of a thoroughly satisfying ice cream sundae (for there is not one false note in this collection, and that is to be applauded). I couldn’t pick a favorite if I tried, so thank God I don’t have to. Grey is a voice to be watched in the time to come. Unfortunately, the time to come might include the ghost apocalypse, giant kaiju, and forces from the Outer Dark, so you’d better hurry up and buy Painted Monsters & Other Strange Beasts before any of that happens. I guarantee it’ll be worth the remaining time on this miserable, decaying globe, as entertaining as watching a monster movie flicker across the silver screen.